Tabernanthe iboga is at home in the rainforests of West Africa. Temperatures here are always above 20deg C and frequently above 40 deg C. In fcat, iboga stops growing at about 15 deg C and looses it's leaves at about 10 deg C. The tips start dying back if exposed to 5 deg C. Repeated exposure to 4 deg C will cause severe dieback from which the plant may not recover. A sinlge frost or a couple of nights at 1 or 2 deg C will certainly kill most plants. The rainforest provides a very moist and humid environment. Iboga plant will adapt to dry air, but will shed their leavs first. The new leaves will be smaller and tougher, but will withstand very dry conditions as long as the plant is watered frequently. Hardened iboga plants can be grown under HPS or other artificial lights. Being rainforest plants they prefer light at levels of less than 70%. Iboga ideally likes about 50% until it is a couple of years old and can then tolerate more. having such low minimum light requirements means that this species can easily be grown along the perimeter of artificial light rigs, where other plants will not be happy. It is also well suited as an indoor pot plant, but should be kept away from windowsills during winter. Rainforests produce water by causing condensation of moist air in the lower strata of the forest. This keeps the rainforest floor damp at all times. The constant flushing of condensed water means that nutrients are constantly washed away. Most rainforest plants are well adapted to efficiently capture these nutrients in the upper layers of the forest litter and soil. When cultivating plant we should try to emulate this soil by using a light mix of leafmould or composted bark shreddings. Rainforest soils have perfect drainage and this can be a problem in commercial potting mixes. To avoid waterlogging it is wise to add at least 1/3rd coarse sand to the mix. Iboga quickly gets rootbound and needs plenty of space. The efficient rootsystem is also very vigorous and needs rooms to spread. Iboga is a heavy feeder and responds quickly to fertilising. Soluble fertilisers are a waste here due to high water requirement. Composted manures are perfect. There was a fair bit of seed available until the end of 1999. Most of this was supplied to retailers by Dan Lieberman (South Africa) who tragically died in a car accident mid 2000. Most seed sold around the world since then has been from old stock. Shaman Australis has now sourced a new supplier and is making seed available on a seasonal basis. Iboga seed is VERY perishable. In poor storage conditions it can loose it's viability within a few weeks. If kept at optimum conditions it will last about 4 months. To store seed properly it needs to be stored in a moist environment at about 10 degC. This prevents the seedcoat from drying out. Very fresh and moist iboga seed germinates easily and without problems. As soon as the coat dries somewhat the seedling will struggle to emerge from the seedcoat and may rot. The seedling can be assisted by keeping the seedcoat very moist and soft, or by using a scalpel to carefully remove sections of seedcoat on a day by day basis. A piece of wet cotton or fabric can be used to keep the seedcoat moist by draping it over the emerging seedling. A high humidity environment (humidity dome or tropical hothouse) is essential. If using a scalpel to help the seed it is important never to injure the cotyledons that are folded into the tiny folds of the seedcoat. Accessing 1mm per day is all that is needed and prevents excessive damage. As you ease the constriction with the scalpel, the seedling will slowly push itself out a little further, thus revealing the next safe place to cut another 1mm. trying to remove the whole seedcoat at once is almost guaranteed to fail. You should aim to remove the seedcoat within about a week of the seedling emerging from the growing medium, as any longer may weaken the seedling beyond recovery. Under normal circumstances the seedling will shed the seedcoat within 2 days and this is the minimum it should be allowed to try without interference. To germinate the seed you will need to prepare a tray, pot or punnet with coarse sharp sand (please look up the exact preparation, as most other media and plain sand are entirely unsuitable). The punnet, pot or tray has to be perfectly free draining, which can be achieved by placing plastic shadecloth in the bottom to prevent the sand from escaping. The sand has to be at least 5cm deep. Place the seed in the coarse sharp sand about 10mm deep and water well. Never let the sand dry out, as if the seedling is about to emerge at this time it will dry up and die. Also, if the medium dries, the seedcoat may dry and prolong germination. Keep seed at a minimum 25 deg C air temp. However, to achieve good germination the air temp should be about 30-35 deg C. Lowering the temperature will delay germination and increase likelyhood of fungal attack. Germination may occur within a few days, but may take up to several months, so be prepared to keep looking after the seeds throughout their full germination phase. Never expose seedlings to dry air until they have at least 3 sets of leaves. This is also the best age to transplant the first time. Their first new growing medium should be mostly sand (90% coarse sand + 10% good potting mix) and should not contain ANY manure or other strong fertiliser. Osmocote is a good option here, but should be applied at minimal rate. Once the plants get to 5 pairs of leaves they are ready for strong growth and normal fertilising and should be potted into a mix as described in the section above. Iboga cuttings are fairly easy to root. Take a stem section with two nodes. Remove the leaves from the lower node and cut off 2/3rds of each remaining leaf. Now insert the lower end into a tray or pot of coarse sharp sand. Rooting hormone makes no difference in this process. Put the pot or tray in a hothouse or humidity dome and keep moist, humid and very warm. Callus forms after about 10 days and roots emerge after another few days. Pot into a sandy potting mix after 4-6 weeks or when the plant has grown by another node. A cheap and easy hothouse can be made from a softdrink bottle. This is possibly the most perfect way to establish your cuttings. The bottle used should be at least 500ml. If it is larger than 1l, then the air might be a little too dry for the cutting, but it will still work. Choose a pot with a diameter a little larger than the diameter of your bottle. Fill the pot with coarse sharp sand, and place the single node cutting at least 3 cm into the medium (note: plant shown here is NOT iboga - this method can be applied to may different plants. Growing medium shown is not sand.). 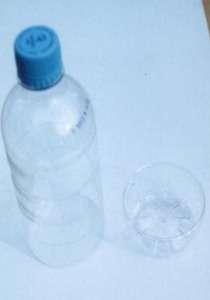 Cut the bottom off the CLEAN plastic bottle and push it about 2-3 cm into the medium. The plastic cap can be used to adjust the humidity and temperature inside this min-hothouse. It is advisable to never close the vent completely, but for the first couple of weeks it is best to cover the hole partially to increase humidity. Place only one cutting per unit to avoid overcrowding. Watering can be done throught hole, or the bottle removed for maintainance. Most collectors will start their plants in pots as these can be placed into appropriate conditions without disturbing the roots. Iboga likes a lot of nutrients and will need plenty of root space. Make sure that the soil never dries out as rainforest plants have no protection from excessive transpiration. Plants can also be hardened off to survive in non-humid conditions. To do this without stressing the plant too much, remove all the leaves from the well established plant, leaving only the tiny growing tips. Now place this plant into a dry but shady spot and always water it well. As the new leaves grow they will be much harder and smaller. Fertilise only when it is hot enough for the plant to actively grow. Composted manures are preferable to liquid fertilisers, but both will achieve results. Regular repotting into larger pots allow the addition of manure to the new potting mix.